Our tennis programme for kids is made for those ranging between 4 and 16 years old. 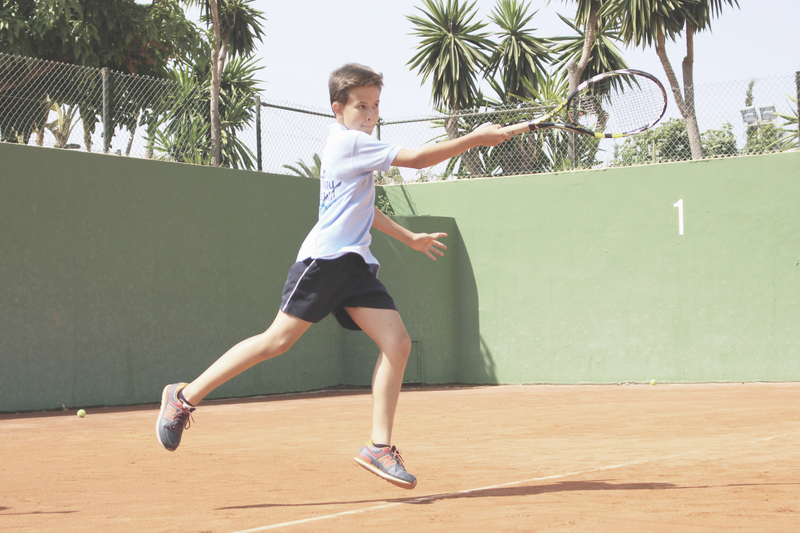 The tennis academy of Puente Romano offers tennis courses throughout the whole year. This way, our tennis academy in Marbella, makes different options available for children living nearby and also those that are in Marbella for a holiday, since we offer tennis summer courses and tennis courses for children on school trips. Pupils of Puente Romano Tennis Academy, Amor & Paz, will be able to Access to this special offer for private tennis sessions. This is an exclusive offer with a reduced price on private sessions buying one or more vouchers of 5 classes. You could buy this voucher until 31/03/2019 and play classes until 30/06/2019. Reservations will be subject to availability at the moment of the reservation. A tennis school where children between 3-16 years old can enjoy this sport, at the same time as they grow up and develop surrounded by true values that will accompany them the rest of their lives: Love & Peace. A philosophy that has helped all the family members in this great team wake up their consciousness, and has enabled everyone’s personal growth to be achieved through respect, acceptance, affection and understanding, rather than focusing on learning through repetitive, mechanical systems that negatively affect self-esteem and cause pain. Amor & Paz is a pioneering initiative that has served as a guide for professional tennis players who, after embracing this new way of understanding life, have been able to go through a transformation sparked by self-discovery, like: Santiago Giraldo, Daniela Hantuchova, Fernando Verdasco and Novak Djokovic. Discover more about this marvellous project. Parents and their children have an essential role to play during lessons. Send us your application through the following form and we will get back to you as soon as possible. Classes on Bank Holidays will be cancelled. When during the month there are more than Bank Holiday included within the school calendar, one of the days, the class will take place. Bank Holidays with classes will be informed as soon as possible. A form has to be filled to join the Tennis School. If the form is not completed with all the details it will not be admitted. All fields are compulsory. The payment of the tennis school will be done at the Tennis Club Reception through the credit card provided and automatically from the 8th of each month, or in the Reception until the 7th of each month. Every pupil will have a group and a timetable assigned. If you wish to change group, you have to contact the Director of the Tennis School. Changes will not be allowed once the month is started, it will only be possible the following month. Pupils that are not up to date with the payments will not be allowed in class. NO classes are recovered except for the ones specified above.